Here's a snippet from my favorite review of Night Road! Don't forget---I'm giving away a copy of Night Road. Comment to this blog entry and you'll be entered. The winner will be announced on the 21st of March. Also, just fyi, I often run contests on my facebook page, so if you haven't checked it out, don't be shy, join me there, too! I have had so much fun talking to book clubs in the past few years. If you’d like to talk to me about Night Road, just fill out the form on my website Kristinhannah.com and I’ll do my very best to be available via speakerphone on your meeting day. I know you’ll find a lot to talk about in this novel—it’s about such a timely subject and the choices these characters make are sure to spark some animated conversation. THANKS SO MUCH to all of you who supported Winter Garden in trade paperback. It is currently on its TENTH WEEK on the New York Times best seller list. Sales have exceeded my wildest expectations—and best of all, I am hearing so much wonderful feedback. It’s been especially well received by book clubs, and it’s been a pleasure to talk to so many of you about it. I appreciate all of your support for this novel that is so near to my heart. Hoping to meet you this coming week near Seattle. Books have always been my relaxing escape from real life. Thank you for being a part of that! I can't wait for Night Road. Unfortunately, this week is INSANE. I have a bridal shower next Saturday in my building and I have to clean and shop for that. The kid and I are in a wedding in May. I have absolutely nothing planned for April so I hope to get a lot of reading done then! This is definitely on the top of my list. Safe travels on your book tour! I know, no matter what you buy, you'll look marvelous! It's starting to get warm and Spring-y in many of your dates so that will be nice! Senior son here...now! He came home late last night (worry, worry) with GREEN shoes. It was St. Patrick's Day and he and his friends decided to spray paint old shoes green to wear for the day. NEVER a dull moment! Soooo looking forward to reading this story!!! The weather in Atlanta is touch and go. Three days ago the bottom fell out, the next day it was chilly, today it was a beautiful 75 degrees! Tomorrow is supposed to be 82, but the forecast calls for Sunday to be 66 :( Random. So be prepared for any of the above. the count down is on til the release and I am so excited!!! Kristen, Your book Firefly Lane was amazing! I have never been so moved by a book. It was a wonderful journey through all kinds of different emotions. I remember feeling so mad at Tully, and yet feeling so sorry for her. When I finished the book I was on our back patio and as I finished my husband came out and hugged me. I didn't realize how hard I was sobbing! Keep the amazing novels coming! I just love your books! And thanks to Firefly Lane, we started a bookclub at work- we will get to meet you next week at the Seattle book signing pre-event! Sooooo excited!! I love your work! I just finished True Colors, I LOVED IT! It was my f4th book of yours. Currently just picked up Angel Falls, so far I am hooked! Thanks for putting out such tear jekers, and page turners! =) I would love to win a copy of Night Road!! I love rainy weather too - the best is to be curled up at a coffee shop with a laptop and writing, or reading a great book. I'm glad you have a new one coming out just in time for rainy days! Pittsburgh definitely sees its share of those. And I'll take ANY excuse to road trip it to NYC so maybe I'll catch you on tour there! Ha! A breakout novel -- what a great compliment! But, I thought Winter Garden was also a breakout book for you. With the success of Winter Garden, it must be a relief to know that it is getting outstanding reviews! Told you last year you had taken a huge leap in your writing -- and it sounds like "Night Road" is only reinforcing what many of us who know your writing experienced. You've said enough about your new book, I'm a little bit nervous to read it because it feels like it's going to hit very close to home for me. But, it sounds like a story that needs to be told. I'm expecting a roller coaster of emotions, with some of your unexpected twists and turns! Tried to watch the video, but couldn't bring it up. Probably because I don't have an account with B&N. I'm counting down the days until I can buy your book -- am trying to finish Jodi Picoult's new Book "Sing Me Home." It's okay. I'm almost 3 weeks from finally meeting you -- I'm both excited and a bit nervous. Have a great time on your tours and meeting both new and old fans! Looking forward to another great Hannah book! I can't wait to read the new book! Finally got the interview to work. Really enjoyed what you had to say -- you can be proud! Now, I can't wait! Personal experiences always make for compelling stories. Have been meaning to tell you that I gave Winter Garden to a number of female friends at Christmas -- one happened to be a psychiatrist. She had her staff read the book, and has recommended it to all of her female patients who have issues with their mothers. She says it is the perfect book for women who have complicated relationships with their mothers. Thought you might enjoy that feedback. You're right, rainy (or snowy!) days are perfect days for reading, but so is spring vacation and lounging by the pool. Night Road is coming out just in time. Thank you! I am an unusual Mom of three children born in 1975, 1981, 1993.Thus this the last time I have to go through senior year, and with each decade I have seen the dangers for kids increasing. I am reliving the feelings myself of that last yr. with the antici-pation of adulthood on the hozizon and hope to win a copy of your book. Kristin, I love the video at B&N I understand completely why you haven't watched it yet but it's great you should take a look! Can't wait to get "Night Road" the story seems very compelling! I was reading more about your new book on BookReporter this morning, Carol really enjoyed it. I'm not sure I'm ready for it, I am the mom of twin girls, who will be heading off to college this fall. They are good girls,but I too know the pull of friends and peer pressure. There is much talk about the drinking increasing amongst the seniors and drug use too. We are in a mid size town, mostly middle income FL town, and a little microcosm of what HS life is like. I worry, we talk, I pray. I'd love to win a copy, it will save me the 12.99 for my Kindle...ha ha. Thanks Kristin, really looking forward to this one. Oh, and I write a blog and do book reviews too :). I read enough of Sing You Home (Sing Me Home..can't remember the title) to know I didn't want to continue. Rarely happens to me. Recently finished Belva Plain's last novel, Heartwood. It's actually part of the Evergreen series. Very nice. I'm creeping up here on senior year myself, and honestly, it gives me panic attacks. I don't know how I will send my son off to college. I'll never sleep. Can't WAIT for Night Road. I am so excited for this book to come out. I will be one who picks it up that day! Congrats on the good reviews of the book! Hurray, I can post again (was waiting until the last day of the March 15th deadlined contest)! But then it doesn't look like the number of times someone posts before the end of a contest is a problem so I won't worry about that anymore. You NR plot sounds great--can't WAIT to read it! I'm currently reading Michael Crichton's "The Great Train Robbery". Yeah, I know, you're all reading the new releases and I'm still stuck in 1975! Heck this author isn't even walking amongst us anymore--but what a great loss. I forwarded your e-mail to my Lynnwood Washington friend (Cindy) in hopes I can attend your Seattle tour date vicariously through her. OK, the word count is climbing so off I go. I am single mother with three children, my oldest being a senior. It is a stressful time for us as she has her heart set on going to college and I am working very hard to see to it that it happens!! Reading is my one get away, can't wait to read your new book, "NIGHT ROAD"! Just finished reading "The Things we do for love" another one of your great books. Going to see if I can find Summer Island. Not to many more and I will have read them all!!! Hi, Kristin..can't wait to start Night Road, as I have just finished senior year with my son who is now in his freshman year of college; also have a daughter out of college and working in children's theatre for 2 years. I loved Firefly Lane and Winter Garden among all of your books. Right now I have just finished Belva Plain's last novel, Heartwood which was a nice wrap up of the Evergreen saga. I also read Meredith Baxter's memoir, Untied, and am in the middle of Brava Valentine by Adriana Trigiani. I have Jodi Picoult's latest on deck and eagerly anticipating Night Road. Since I can't make it to any of the booksignings (boo hoo), it would be great to win an autographed copy. Thanks for all of the great writing and good luck with the tour! I am so looking forward to reading Night Road. I just finished Winter Garden and I absolutely loved it. I just couldn't put that book down. I have read a good portion of you're books and have loved everyone of them. My all time favorite (out of your books and others that I have read) is Firefly Lane. That book was the first book I had read in a very long time, plus I was never into reading in the first place, and now I love reading. I have also gotten my mom to read them and she as well loves them. I am currently reading Best Friends Forever by Jennifer Weiner. So far it is hard to get into but my mom said it gets better, so we will see. I recently read Goodnight, Beautiful by Dorothy Koomson and that was really good. There are so many other books that are on my list to read and I just don't know where I am going to get the time to read them all!! Good luck on your book tour!!! I have read a good portion of you're books and have loved everyone of them. My all time favorite (out of your books and others that I have read) is Firefly Lane. That book was the first book I had read in a very long time, plus I was never into reading in the first place, and now I love reading. I have also gotten my mom into reading your books and she as well loves them. I checked at the bookstore you are scheduled at for any pre-event, and I didn't see anything that I need to register for. If you happen to know of anything extra happening in Raleigh-Durham, please respond on the blog or via my e-mail if you can find a minute. Maybe Kim could do it if there is something that I need to sign up for. I called Quail Ridge and they said that there wasn't a pre-event, but your blog post threw me off a little. I definitely don't want to miss a thing.. OMG! Fourteen days away! I don't think that I can stand it! :) Weeeeeeeeeeeeeeeeeeee!!!! Just finished reading "On Mystic Lake" and visiting in California was the perfect to finish it; and have also been to Seattle. Brought back lots of memories! Thanks for writing... Can't wait to start reading "Night Road". Is it available on ebook yet? Looking forward to reading this book too! I forgot to say that I already ordered a copy like months ago (but then the price went down and I cancelled and ordered again). I'll probably order the ebook, too. I'm in the process of buying the backlist electronically and have maybe 1/4 of the books so it's slow going. I feel like it's been forever since a new book, but it hasn't been. I'm just impatient. :) I will try to start it this week, but I definitely have time next week! Hi Kristen - Loved the B & N interview - so much fun to hear you speak as you are not going to be close enough for me to see you on your tour. Am looking forward to reading Night Road. Who won the ARC previous give away - where were they located? Please enter me in this one. Hope you have a great tour! I just finished NIGHT ROAD and I have to say this is my favorite of all the books you have written. I could relate to Jude, Caroline and even Lexi. I cried, laughed and smiled with this book. I also read it in 2 nights. 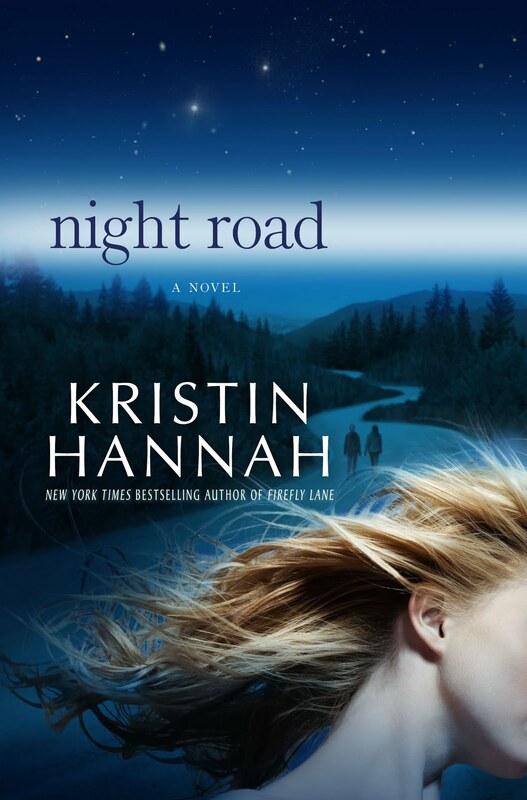 Hi, I just finished reading my first Kristin Hannah book, Night Road. I sat up last night (or morning) until 3 a.m. to finish it and went through half box of tissues. I get my books at the library and plan on looking for past books. Also will let my daughter-in-law know about your books. She has a book club in Westfield, NJ. Thirteen women are meeting in northeast Iowa tonight to review Night Road. Winning these books in a contest was exciting. Thank you. For some of us this is the first time reading you as an author. The conversation is lively. We are all amazed at all of the discussion that Night Road has generated in our book group tonight. We have talked about parenting our children, our own parents, social issues such as underage drinking, relationships, wealth/poverty. We may not finish all of our discussion questions before midnight! Even though this was a sad book in many parts (we used a lot of tissues while reading), our group had many laughs tonight. It was an excellent discussion - one in which we learned a lot about each other through our discussions of each character. Now it is time for chocolate dessert! These Jan. 17, 2012 comments all came from the First United Methodist Book Group in Decorah, Iowa. We won these books in a readinggroupguides.com contest. Thank you very much to Kristen Hannah for the books and the fodder for a great discussion. Just finished reading 'Night Road' , amazing read. I am a member of the Seven Sisters bookclub. Loved the book, looking forward to your next book. Our book club, Bookbabes, from Fargo, ND won a contest to read Night Road and to post our discussion afterwards. The book proved to result in a very emotional discussion and we realized that it was due to the framework of our past family relationships when we grew up and how we had coped with our teenagers as Mothers.. A range of many emotions regarding the Mom, Jude, some very judgemental until we all presented our views. Much empathy for Lexi. It should be noted this club are members who have worked in the field of Psychiatry for many years. We all agreed it is an excellent book for parents of teenagers to read to start a discussion with their teenagers about drinking and driving. The members decided this was a very good book for a book club to read as a result of the discussion we had. Thank you for choosing us as your winner and continued success to Kristin Hannah. Thank you for honoring us with several copies of Night Road for our book club, Little Neck Moms Read, in Little Neck, New York. Most of us read the book in a day or two and admitted that it took us on a rollercoaster ride of emotions all the way through. I enjoyed your live chat on Pauline's Book Movement and on goodreads last night. Thank you for making your reading so accessible and making YOURSELF accessible to us! It's a special thing. I'm on my fourth book and look forward to many more from you. Our Book Club won copies of Night Road! While I have read other of her titles, she was a new author to everyone else. Besides being sssooo excited about our Book Club winning, we had one of our better discussions. There was so much to discuss: Was Jude overly involved in her children's lives? Did she act entirely inappropriately to her loss or is that normal grief? What we as parents have done in the past, faced with the knowledge our kids are partying, and was it effective? It evened opened a discussion on why the drinking age is 21, but for all other "adult" activities [voting, criminal offenses, marriage] the legal age is 18. Would lowering the drinking age diffuse that "party/binge" mentality? Great read! Thanks for choosing us! Can't wait to get my hands on a copy of Home Front. P.S. We are a Book Club from Vista, CA. I am in a book club, 7 Sisters, and received a free copy of Night Road. I loved the book and couldn't put it down through my tears! I would recommend the book to anyone along with a box of tissues! This was my fist time reading Kristin Hannah and am looking forward to a long reading relationship. Our book club read this for our Feb book (thank you so much for the copies!) and I thought it was so realistic- Jude trying to be super mom and inadvertantly sending her kids the wrong message, her pain and anger, etc. I think any parent can relate. I recommend it! Thank you for sending copies of Night Road to our book club in Minnesota. We read the book at our Jan. meeting. While we thought it was a very timely topic and did generate a lot of discussion about parenting, we generally did not care for the book. There were moments of good writing but the characters did not connect with us. We felt no empathy for Jude, even thought we could certainly understand her depression and guilt. We did like Lexi but felt her story wasn't developed enough. The ending was too rushed and neatly wrapped up. I have read Winter Palace by Kristin and enjoyed that book but this one was a disappointment for me, personally. We are a book club that has met for 10 years. We are of the "older" perspective, so many of us have given the book to our daughters and will be interested in their response to this book. Our book club was lucky enough to win copies for the group. It was our February read. None of our 13 members had read your owrks before so it was a delight to be introduced to a new author. The group ranges in ages from early 30s to mid 60s. Most have grown children, a few some still at home and some none. So, as you might imagine, the book elicited a lot of conversation and discussion. About two hour worth! We all weighed in on the questions in the reading guide and used the book to discuss our own parenting and mother/child relationships, forgiveness, and loss. All felt it was a quick read, but one that had a lot of discussion points. Our Book Club read Night Road and found many topics for discussion. Namely--motherhood, friendship, difference in social class, drunk driving, punishment, responsiblity and handling grief. Thank you for the opportunity to read your fascinating book. The Brown Bag Book Club at our senior center was fortunate to win copies of the book. It sparked a really good discussion - much of it focused on motherhood and drinking and driving. While we had a lot of sympathy for Lexi, a few still felt she was in the wrong for driving at all. Most felt she did the best she could at the time and the parents should take more responsibility for what happened. The father was almost a non character in the book and we would have liked to see more of him. We felt little sympathy for the mom. Some felt the beginning of the book was too long and would have prefered to get to the incident sooner, but it was easy to read and the last half of the book was captivating. The parellels between Jude and Lexi did not go unnoticed. One of our members exclaimed "I have a new favorite author!" Starbucks bookclub of West Hartford, CT just read and loved Night Road. The theme of the book struck a chord for some of us as wr have recent college grads and still worry when they are on the road although not right under our noses. Kristin aroused such a swell of emotions and beautifully captured the range of feelings that Jude, Zach and Lexi experienced. A few of us felt that Jude's involvement with her children was over the top yet we could relate to the family and could even see them as our neighbors. We would recommend this book for parents after their children graduate high school. Our book club, the Last Wednesday Book club in Colorado won the book in a contest. We met last night and we had a lot to discuss. I finished the book in a day and was a blubbering mess when my son and husband got home from school. This was a very thoughtful book and I'll be passing it along to friends to read. We have also read Winter Garden and Firefly Lane for our book club. Thank you for giving us a lot to discuss. can not begin to express the enormity of emotion I felt while reading Winter Garden! Thank you!